I’ll bet if you read all of the Blogging A to Z Challenge posts today, you would find a lot of very interesting creative Z words. But I also bet you’ll find a lot of Zombies. Zombies seem to have become very popular over the last few years. I’m not sure I’m as fascinated with them as some people I know, like my friend Stephanie over at Clay Baboons. Now This Girl Knows Her Zombies! 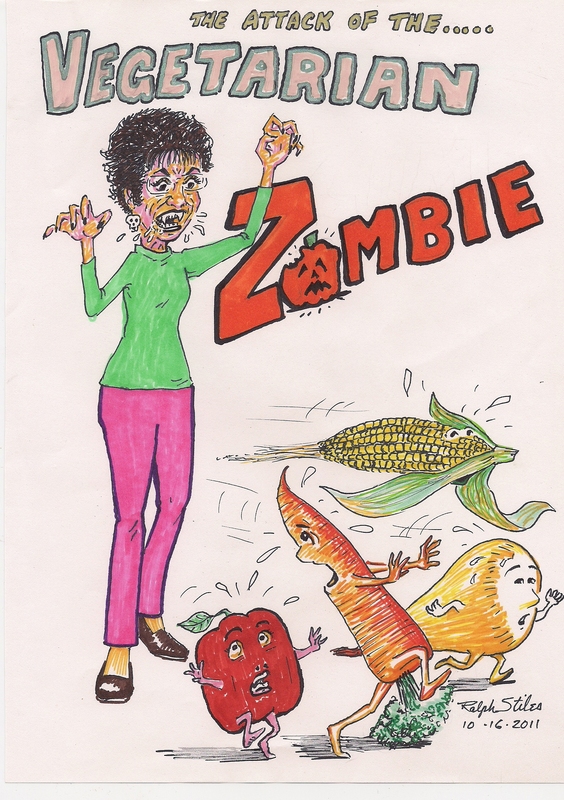 But a few months back, I refered to myself as a Zombie Vegetarian. My explanation for this was that there are times when I eat mindlessly within my chosen food criteria. I eat the same thing all the time. I’m Boring. It’s as if someone, presumably another Zombie, has eaten my brain and I can’t think of anything new and different to try. I stick with what I know. Those of you who are familiar with my wonderful husband Ralph, he only had to hear that remark and he went to work. This is what he came up with. Yes, that’s me…terrorizing innocent vegetables. It might amuse you to hear Ralph’s version of the day I was slicing carrots with my food processor to make soup. He made a Silence of the Lambs reference. He said he had awakened to the screaming of the spring yams. Well I guess you had to be there, it was pretty funny at the time. Just so you know, I AM trying to be more creative with my veggie selections, moving slowly into new and different foods and recipes. This is my twist on the Zombie theme that I’m sure is slowly dragging its feet across most of the Blogging A to Z community today. As always, Ralph is kind to me in his drawings and I look a lot better than most Zombies. But I’m still stalking those little veggies! The Blogging A to Z Challenge has been a huge learning experience for me. The organizers have requested that we post on May 7th about our experience with the Challenge. I just found that out today, again thanks to Stephanie. As Gram used to say…Always a Day Late and A Dollar Short! Regardless…I made it… A to Z!!! Tomorrow it will be business as usual here at BCDC. Guess I have to come up with my own topics now. Do I remember how?? Well, it’s May Day…That should give me something to work with. 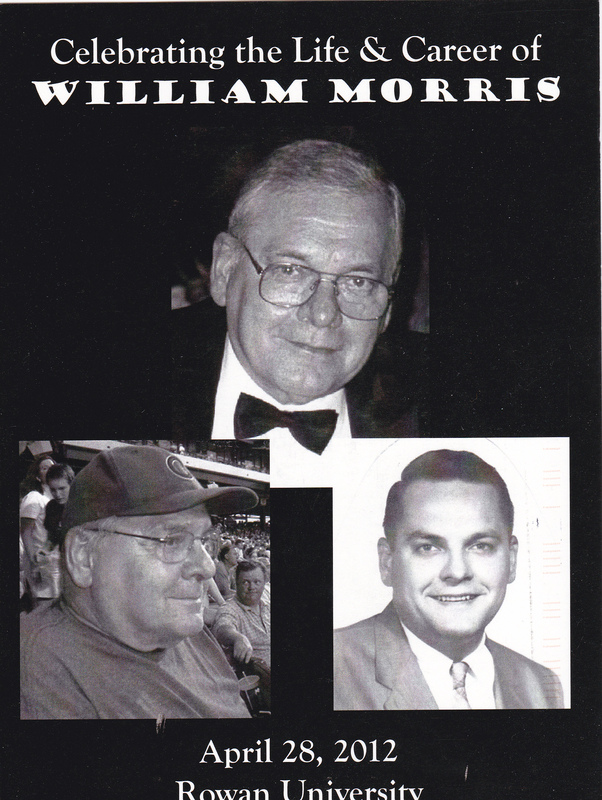 Saturday, I was privileged to attend a Memorial for one of my college professors. I’ve talked a little about being a speech and theatre major at Glassboro State College/Rowan University. It was one of the most exciting, frustrating, crazy times of my life. I learned so much and met so many wonderful people. One of my favorite professors, Dr. William C. Morris passed away earlier this year. On Saturday, I was fortunate to attend his memorial service, held in Tohill Theatre where he directed and acted in so many plays. It was a great celebration of the life a terrific guy. I got to see a lot of familiar faces. 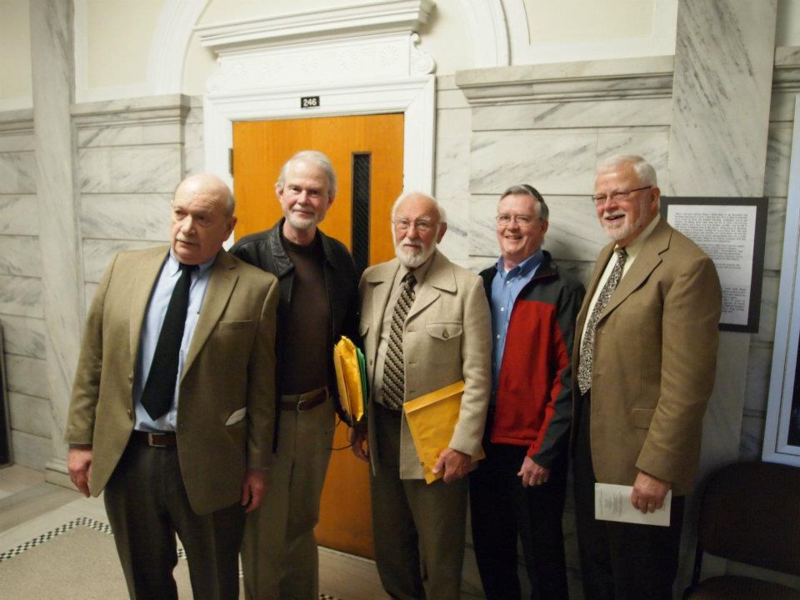 A group of our other professors who led the way. Great group of guys! Sadly, I didn’t take any photos of my own of my fellow students who were there. I was too busy talking and reminiscing! Ralph and I decided to grab some dinner on the way home. We made the Very wise decision to stop at Italian Affair in Glassboro. We had been here once before, but it was for a luncheon after a funeral and it wasn’t appropriate to take photos that day or to write about it. It’s been hard keeping it under my had all this time. That’s why when Ralph suggested lunch, I jumped at the chance. It comes with the house dressing which is oil and vinegar and Lots of garlic. So tasty. So good in fact that if they had offered me a really big bowl of this and the bread…That could have been lunch for me. 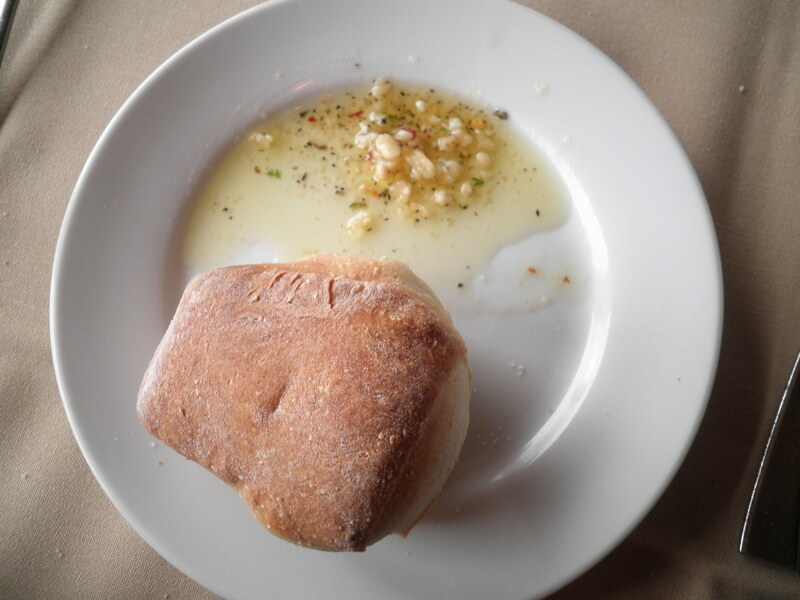 Wonderful little dense rolls served with herbed olive oil. So good, I could have eaten the entire basket. But I behaved and only ate 2. 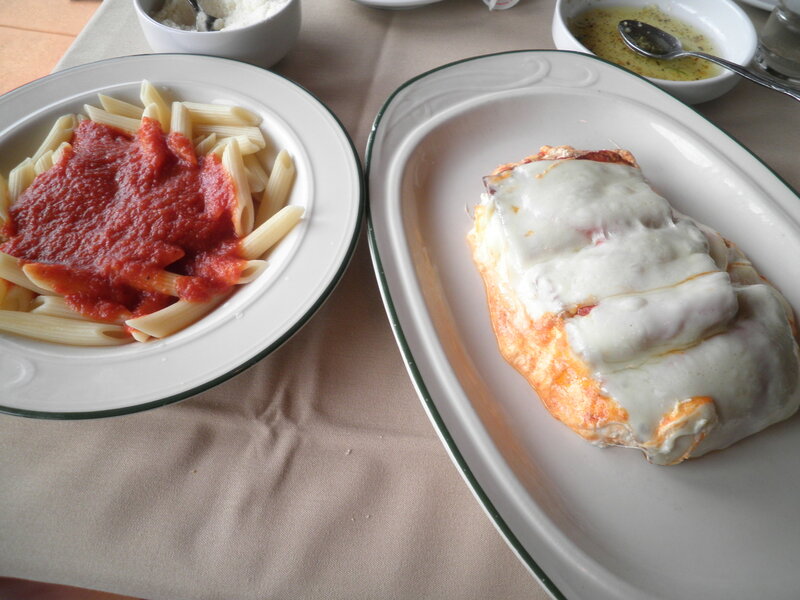 My entree…Eggplant rollatini with ricotta inside with a side of penne pasta. The plain marinara sauce on the penne was delicious. The eggplant was incredible. So many times when a restaurant does eggplant, it’s heavily breaded and greasy. This was very delicately breaded and cooked to perfection. I couldn’t finish it, and brought about half of it home. The leftovers didn’t last long once I got home though. We didn’t do dessert, but we had coffee and I have to say as a coffee lover, it was outstanding. Ralph had one of their specials which was a filet with crab and shrimp in a white sauce surrounded by roasted red peppers and spinach. He insisted that I taste the veggies and they were delicious. He thoroughly enjoyed it. We would definitely go to Italian Affair again. The service was great and they make everything feel special. We spoke with the chef’s wife on the way out and told her how much we enjoyed it. We will certainly be making a return engagement there. It was a very emotional day, but very enjoyable. Happy Sunday! Tomorrow I will complete the Blogging A to Z Challenge… Hooray!! Yes! It’s true that the letter of the day for the Blogging A to Z Challenge is the letter Y. And the word for the day is YES! Why Yes for the letter Y? Yes is a nice positive word. Yes, Please. Yes, I would love to have pizza for dinner. Yes, I would love to have ice cream for dessert. Yes, I think and talk too much about food! But seriously. Yes, I am almost to the end of the Blogging A to Z Challenge! I don’t actually believe it. It’s seemed like a very long month. I’m happy that I’ve participated. I’ve learned a great deal about myself as a blogger and I’ve learned to stretch my wings when it comes to topics and how I approach them. My friend Helen at Views from the Porch saw that I was doing the A to Z and was inspired to do the letters in her name. What a great idea! She has a Much longer name than I have so she has a lot more to work with! I started this blog because I love to write. For over a year now, I’ve been working my way through things, learning what I like, what I don’t like. Going with good suggestions from others, coming up with some things on my own. I have learned that I don’t need to hold myself to writing about the same things or in the same way all the time. That’s what I love about writing. I hope that Broken Cookies Don’t Count can continue to grow as I grow. 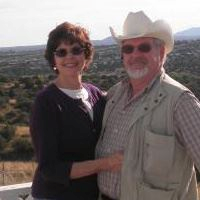 I plan on some changes, updating my “About” page for one thing and adding some of my “before” Weight Watchers photos which should amuse you all. Maybe some updating on the layout, if I can figure out how to do it! I won’t stray too far from what you’re used to. I just hope to make it better. So in the meantime…I say Yes to trying new things in the adventure that is blogging and is my life in general. Hope you stay along for the ride. As the snail said when he was riding on the back of the turtle…WHEEEE!!!! (That’s one of my all time favorite jokes!!) YES…it really is!! Happy Saturday!! “Z” you on Monday with the final day of the Blogging A to Z Challenge. Now the Blogging A to Z Challenge is getting tricky for me. Today’s letter is X. I’ve been thinking about X since around “M” trying to come up with something. If I had approached the challenge from a different angle, I could look up some good “X” words in the dictionary. Yes, I still have an actual, physical dictionary. I could make up some clever words like some other bloggers. I could talk about XBox like some other, other bloggers. I’m not totally sure what XBox is so that leaves me dangling as well. So, What to do with “X”?? How about “X Marks the Spot”? We’ve all heard it for years in cartoons and Pirate movies. That’s where the Treasure is hidden. I love this. It makes me feel a little closer to the place I love and the place I want to be. The place where the treasure is buried. I could have written about X-Files, too. Actually, Mulder and Scully hung around in New Mexico for a while…that could have worked! Oh well, I’m stuck with X Markx The Spot! Happy Friday!! Tell me again “Y” I’m doing this?! Maybe I’ll figure it out tomorrow!! W is the letter of the day for the Blogging A to Z Challenge. I can’t believe that we’re almost at the end of the alphabet. This has not necessarily been easy but it’s been a great learning experience. If any of you have read BCDC for a while, you’ll probably find it easy to guess what my “W” word will be. Weight Watchers has been a part of my life for 25 years. I wrote all about it on the anniversary of when I joined. 25 years and Counting tells the story of how I got to WW. It seems like I’ve always been part of Weight Watchers and yet, some days it feels like I’m just starting out. Weight loss and weight maintenance are real projects for those of us who have struggled or in some cases still struggle with our weight. I often wonder what my life would be like if I had never joined. In some ways, it’s too scary to think about. My major reason for joining was health related. I came from a family where many people suffered from weight related health problems. Heart disease, diabetes, breathing problems. All of those things were real in my life growing up. I didn’t want to follow that same path. When I realized that weight was the real villan in the scenario I decided I needed to do something about it. Of course, like so many others with this issue, I didn’t take the easy route. I would latch on to the latest fad diet and poke around at trying to make it work for me. I’d lose a little, then when I stopped doing it, I’d find that I had gained back more than I had lost. It wasn’t until I joined Weight Watchers that I put it all together and figured out what worked for me. I want you to realize that this is NOT a commercial for Weight Watchers. I don’t work for them anymore and I get nothing out of telling you about what an incredible program this is. It has changed my life and taught me to do the things I should and not to do the things I shouldn’t. It’s a wonderful program because it allows each person to find out what works best for them. In my opinion, Weight Watchers very simply saved my life. 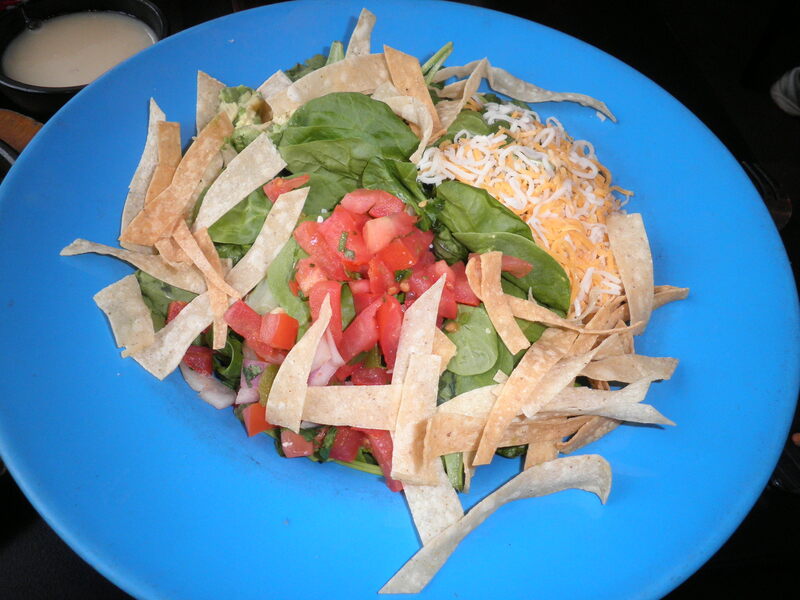 Anyone reading this who struggles with their weight should find out about Weight Watchers. There are meetings everywhere. The people at the meetings are welcoming and helpful. Most importantly, If you go to a meeting and you don’t feel comfortable, Find Another Meeting! Each meeting develops its own personality. Find the one that suits you. But if you need to get healthy, Find A Weight Watchers Meeting. The letter for the day with the Blogging A to Z Challenge is V. It’s also What I Ate Wednesday hostessed by the lovely Jenn over at Peas & Crayons, and for the month of April we’re all adding veggies to our meals. Be sure to travel over to the B/A-Z website to view some other bloggers and to P&C to drool over some good food. Here…you’ll get the combo platter! Time for a veggie badge! Those of you who read BCDC regularly know that I am a vegetarian and have been for about 22 years. I can’t remember exactly when it happened but that’s a decent approximation. I did it after joining Weight Watchers 25 years ago, but that’s a story for another letter. I’m not the kind of person to beat other people over the head about it. I did it for health reasons and I think that overall, I’ve been proven right in that aspect. I’m pretty healthy and take no medications. As my friend from college, Valerie likes to say, I’m not an annoying vegetarian. Although I’m happy to share my knowledge with you, I won’t try to reform you. One of the tricky things about being vegetarian though, is that it’s not always easy to get food prepared the way I want it in certain restaurants. This past weekend I had a very good experience. We were heading out to celebrate our friend Judy’s birthday. Her choice was Don Pablo’s. I hadn’t been there for a long time and didn’t really remember what their choices were like. 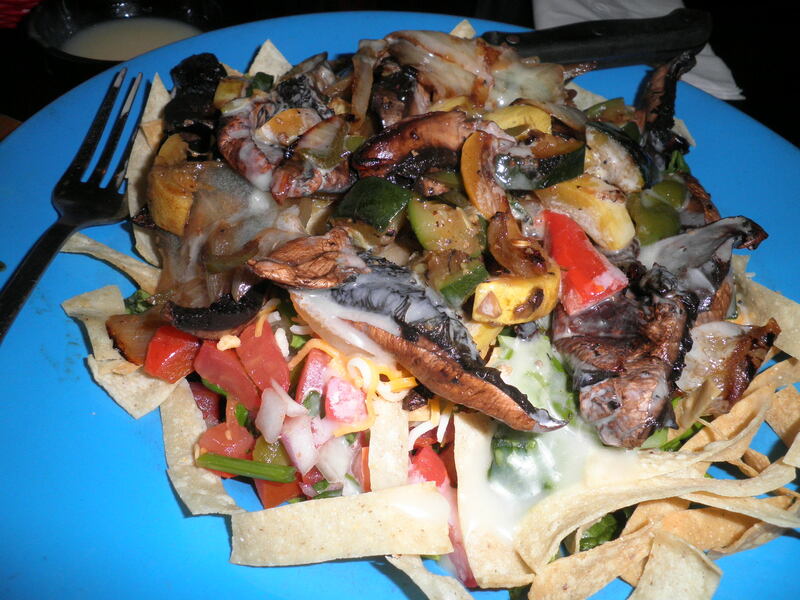 Mexican food is sometimes easy for me but sometimes not. This worked out well. 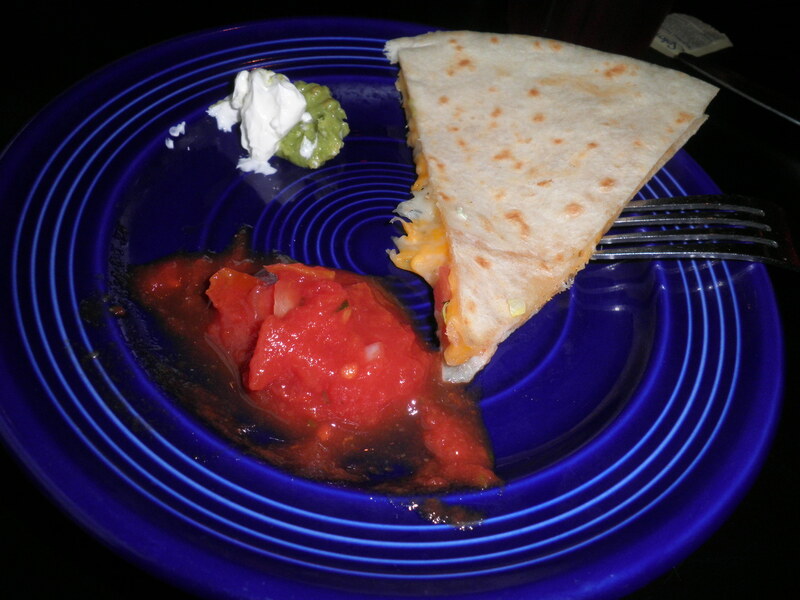 We started with tasty cheese quesadilla for appetizer. Can’t go wrong there! Lots of chips for the others but of course, No Chips For Me! 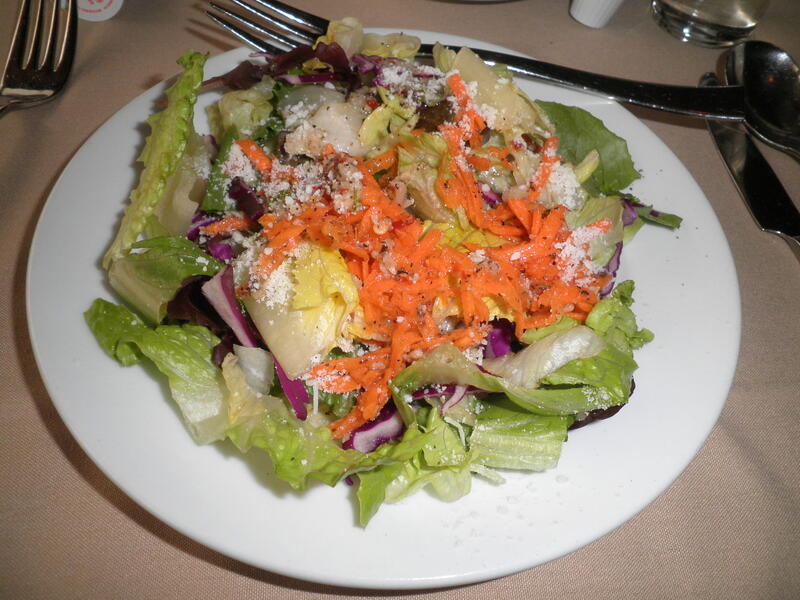 All mixed together with the honey lime dressing…I’ve got to try to re-create this dressing…So Good! 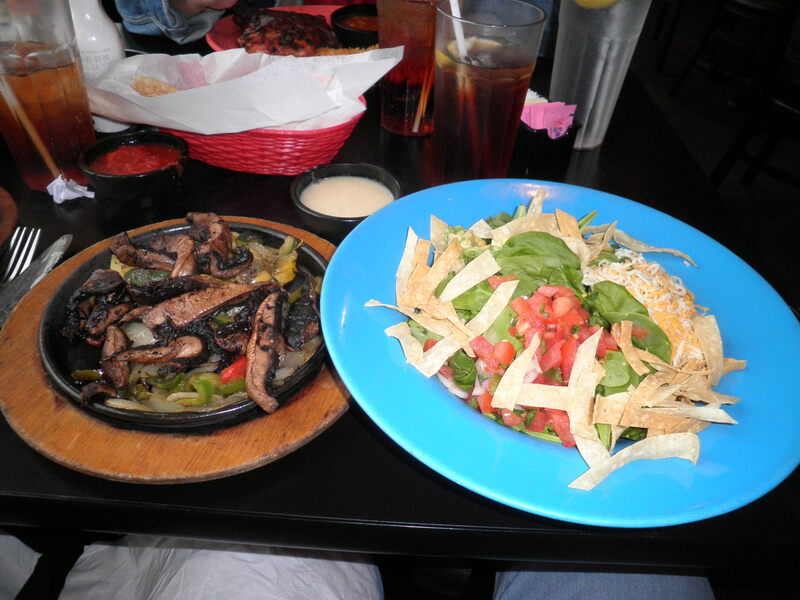 It was a wonderful dinner and I couldn’t have been more happy with Don Pablo’s! 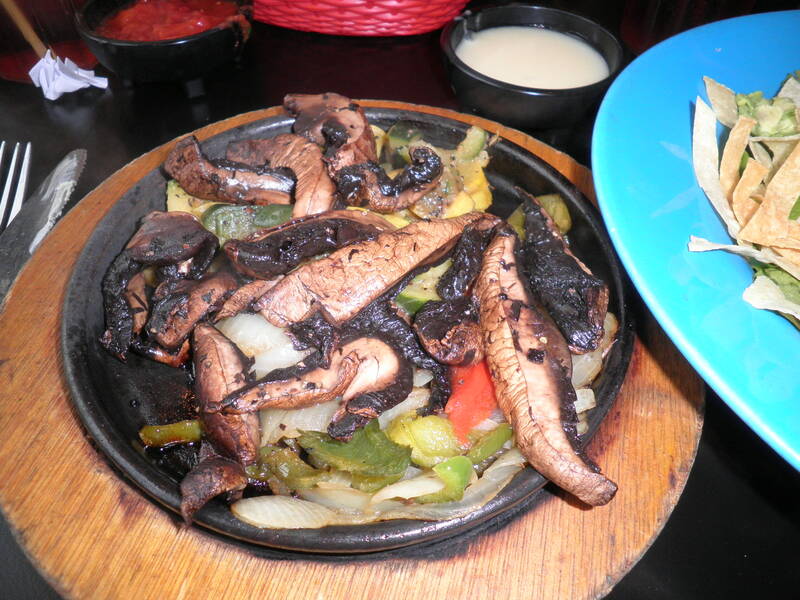 We were seated quickly, our server was very friendly and helpful and I got what I wanted! Who can ask for more than that! 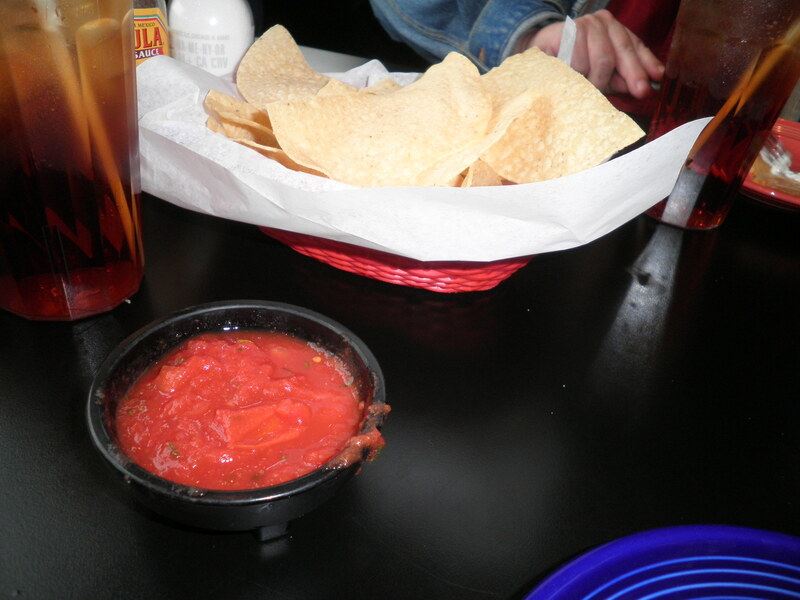 It was cold and rainy outside, but inside Don Pablo’s, we had a great time! Consider making more vegetarian choices when you go out to eat and when you prepare your foods at home. I don’t think anyone would have been disappointed with this dinner and it’s just good for you. But don’t worry, I won’t be too annoying about it! Remember to head over to the Blogging A to Z Challenge and to Peas & Crayons to see what’s going on for WIAW. Read some, comment some and have a Very Veggie Day! U is the letter of the day for the Blogging A to Z Challenge. U is not a letter I think of often. Under is a word that sounds good to me. The Troll Under the Bridge. Scary fairy tale things. What’s under that? A question I remember asking often as a child. As in “Whats under that Rock?” Usually it was something disgusting and therefore fascinating. Under the weather. We’ve all experienced that. My middle finger on my left hand is Under the weather today. It’s as the result of a vegetable related accident. I was cutting lettuce…defying all rules because we’re never supposed to cut lettuce (I always cut lettuce.) The problem arose because I was in a hurry. Large wide head of lettuce. Short knife. This scenario requires squeezing together of the lettuce which obscured the fingers and oh yes…I was in a Hurry! It wasn’t even a very sharp knife. Lots of blood…paper towel…band-aid with extra toilet tissue padding “under” it because this baby was Bleeding! Had to do a rewrap after washing dishes (with rubber gloves.) Must have been the combo of the heat and my hand hanging down. Bloody all over again. I kept my hand elevated all the rest of the evening. I’m not looking forward to removing the bandaid. I’m sure it’s not pretty “under” there. Understand…Underwear…I don’t understand why my underwear gets holes so easily…I don’t wear flimsy, girly underwear. I also can’t understand why I have such a hard time throwing away my underwear when it gets in this condition. I put it in the hamper and say “I’ll wear it one more time.” It goes through the wash, gets folded in the drawer, I wear it and it ends up going into the hamper “ONE MORE TIME.” Over and over. You’ve heard me say before that I have a had time getting rid of things. Understand…that would be a great word to explore on a regular basis. Things I don’t understand. I could fill the Grand Canyon with things I don’t understand. But one of the things I have learned in life is to not pretend I understand something when I don’t. If someone uses a word I don’t understand, I’ll ask what it means. I think that’s a sign of intelligence. At least I hope it is! Understand. I don’t Understand why I’m making more typing errors with my uninjured hand?!? Happy Tuesday! It should be “V”ery easy for you to guess what I’ll talk about tomorrow!